Admission is free, all are welcome! “Farewell Gift to Charlottesville” will be presented by Alvaro Mendizabal at 7:30 p.m. Friday, May 6, 2016 at the at the University Chapel, next to the Rotunda on the grounds of the University of Virginia. Alvaro is graduating from the Darden School of Business this spring and will play this concert as a parting gift to Charlottesville. The concert program will present music of the European baroque and of Latin America showing the baroque influence on Latin American composers. 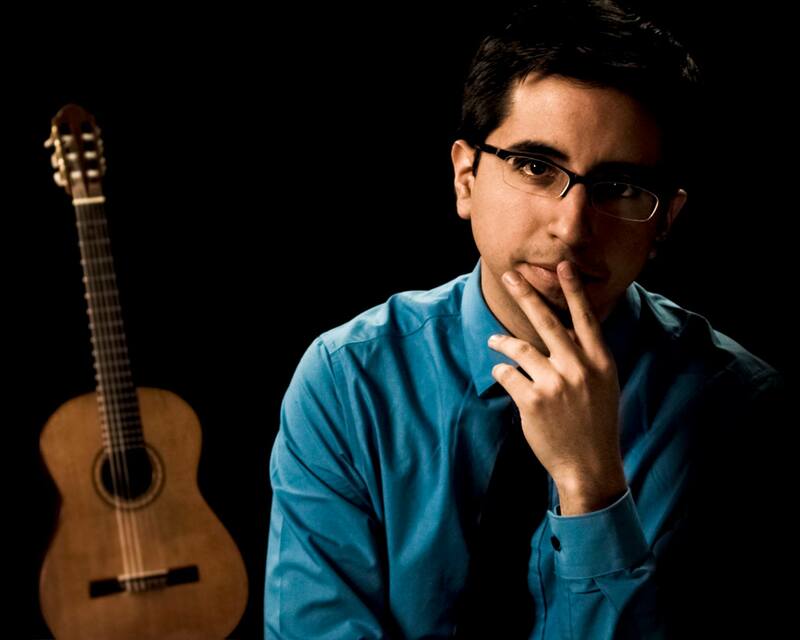 Named “Classical Guitar’s Entrepreneur” from El Comercio, Peru, Alvaro Mendizabal is an artist whose eclectic persona and interdisciplinary experiences allowed him to develop a unique vision for the guitar and classical music. On stage, this ethos materializes in world-class performances of inventive programs that fill audiences with a different perspective of the possibilities of the guitar and classical music. Born in Peru, he started his guitar education at the age of 10 under the supervision of Prof. Alonso Acosta, continuing his studies with the international concert artist Ricardo Cobo. In 2004, he moved to Tucson after accepting a full scholarship from the University of Arizona where completed studies in Classical Guitar Performance, Business Administration and Entrepreneurship. From 2009-2011, he worked with prestigious pedagogues Joaquin Clerch and Antoni Spiri at the Robert Schumann Hochschule in Dusseldorf, Germany. Recent engagements include his return with the Peruvian National Symphony Orchestra under the Swiss conductor Emmanuel Siffert, as well as recitals across South America, Europe and the United States. Notable highlights include concerts with the Tucson Symphony Orchestra under the ‘Echo Klassik’ winner conductor George Hanson. A tireless promoter of the guitar in the classical music industry, he created one of the first guitar-centric management agencies, achieving significant growth for his artists with debuts in many of the most important concert halls in the world, including Carnegie Hall, Konzerthaus Wien and Gasteig. A multi-Award-Winner in classical guitar competitions, over the past ten years Alvaro has taken part in some of the most important guitar festivals in the world, including the Cordoba Guitar Festival (Spain), the Koblenz International Guitar Festival (Germany), Iserlohn Guitar Symposium (Germany) and the Julian Arcas Guitar Festival (Spain) and the Guitar Foundation of America (GFA). During those events, Alvaro was able to participate in the master classes of international artists such as Pepe Romero, Manuel Barrueco, David Russell, Sergio Assad, Joaquin Clerch and Carlo Marchione. Alvaro is currently completing an MBA in General Management from the Darden School of Business at the University of Virginia.